Wilt Chamberlain is a giant in the basketball world, both literally and figuratively. Despite appearing at a time that was not very receptive to basketball cards, Wilt Chamberlain cards remain very popular, especially his vintage cards and autographs. During his 14 seasons in the NBA, Wilt Chamberlain played for the Philadelphia / San Francisco Warriors, Philadelphia 76ers, and retired as a member of the Los Angeles Lakers. The Hall of Fame player racked up an impressive list of accomplishments, including two NBA championships, four MVPs, 13 All-Star selections and the Rookie of the Year Award in 1960. He also spent time with the Harlem Globetrotters before his NBA career began. Shop for Professionally Graded Wilt Chamberlain cards on eBay. However, Wilt Chamberlain is perhaps most famous for scoring 100 points in a single game versus the the New York Knicks on March 2, 1962. He was also reportedly very popular with the ladies, claiming in his autobiography that he slept with 20,000 different women. But that is not a topic we will get into here. Unfortunately, in 1999, Wilt Chamberlain passed away at the age of 63. Despite his contributions to the game, many fans and collectors are unable to appreciate how dominant he was because basketball was not nearly as popular during the time that Wilt Chamberlain played. Combine that with limited footage from that era of basketball and a generally outdated playing style from the NBA as a whole, and it is easy to see why the average fan cannot view him the same way as LeBron James or Michael Jordan. Regardless, as a dominant and athletic seven footer, Wilt Chamberlain was clearly ahead of his time. Wilt Chamberlain cards represent a great option for collectors to obtain a groundbreaking player and connect with the roots of the game. 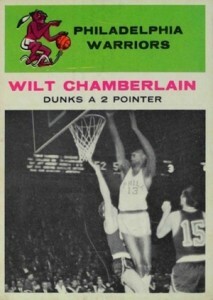 When Wilt Chamberlain came into the NBA in 1959, basketball cards were not very popular. Although Wilt Chamberlain cards would have been among the top options for collectors during this period, basketball cards were viewed as a novelty. Regular releases did not even begin until later in Chamberlain's career. Just a few Wilt Chamberlain cards were released during his playing days and most of the officially licensed NBA cards were from Topps. The following list represents some of the most popular Wilt Chamberlain cards. The majority are from his playing days, so card condition is especially relevant when trying to determine value. Wilt Chamberlain was an NBA All-Star in nearly every one of his 14 seasons so it is only fitting to kick the list off with an All-Star subset card. Found in 1972-73 Topps, this Wilt Chamberlain card remains an in-demand card despite a poor image and a text box that covers over 25% of the card. Like most of the cards during this time, and on this list, centering was a huge problem. Already out of the league at this point, Topps still included a Wilt Chamberlain card in their 1973-74 Topps Basketball release. 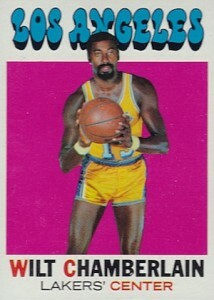 It is notable as one of the few full-action images of Wilt Chamberlain as most of the other cards feature single-color backgrounds, filled in around him. This card represent one of the most affordable options for Wilt Chamberlain collectors. The design for this card is distinctively 70s with the bright pink background and light blue text. 1971-72 Topps Basketball marked the switch back from the "tall boy" format it had used during the previous two seasons. 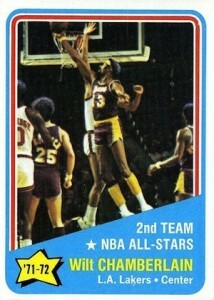 This is another relatively cheap Wilt Chamberlain card for collectors to obtain. Featuring a "tall boy" design, Wilt Chamberlain's 1970-71 Topps Basketball card better displays the size of the giant center. The close-up image shows rich colors along with a red-orange background. 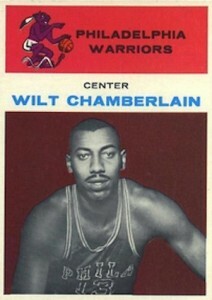 Wilt Chamberlain's name, team and position are displayed in white text over an image of a basketball in the bottom corner. 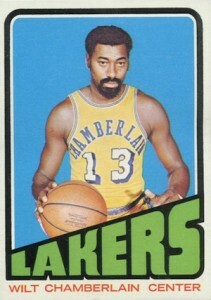 1972-73 Topps Basketball marked the final season for Wilt Chamberlain. Despite a strong run in the playoffs, Chamberlain and the Los Angeles Lakers were unable to overcome the New York Knicks in the NBA Finals. 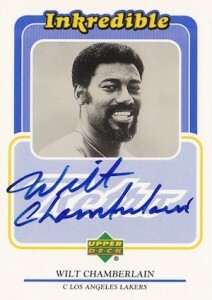 The first card in the set, Wilt Chamberlain's card features a thick black border with a bright blue background. 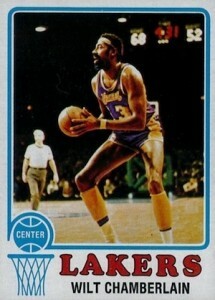 Combined with a green "LAKERS" text, this card is one of the more colorful Wilt Chamberlain cards. Although he is posing with with his typical straight face, it is hard to take him seriously since Chamberlain has his jersey on backwards. Once again the first card in the set, this Wilt Chamberlain card is the more popular of the two "tall boy" basketball sets from Topps. 1969-70 Topps Basketball was also the first basketball set from Topps since 1957-58 Topps Basketball. The set helped begin a string of successive Topps basketball sets that lasted until 1981-82 Topps Basketball. Employing a red background, the border features four small drawings of basketball players on the corners of the card. Card #47 is the not the top Wilt Chamberlain available in this release, but it still commands strong attention from collectors. This card is part of a subset that covers in-action images. 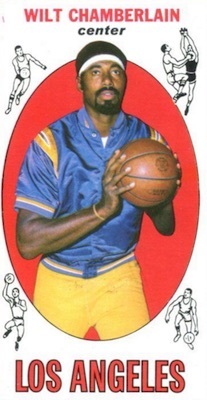 The card shows Wilt Chamberlain throwing down a dunk as a member of the Philadelphia Warriors. Understandably, the card layout is virtually identical to his rookie card from the same set. After Wilt Chamberlain retired, a long time passed before his certified autographs appeared in any product. The aptly-named Upper Deck Retro features a very popular Inkredible autograph set which offers a Hall of Fame checklist never seen before. Although these un-numbered autograph cards fall one per box, on average, values are quite high. 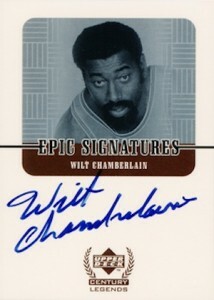 The Wilt Chamberlain card is the clear favorite of the on-card autographs and prices have pushed into the thousands. 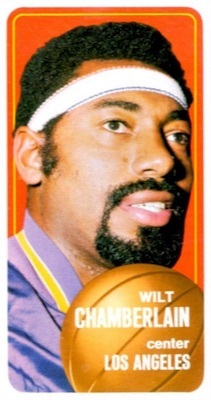 Also, make note of the large smile because this was a rare occurrence on Wilt Chamberlain cards. A very rare Level 2 parallel is serial numbered out of 13 in reference to Wilt Chamberlain's jersey number. Another great option from Upper Deck, Epic Signatures features on-card autographs from an, indeed, epic group of former players. Like Upper Deck Retro, the Epic Signatures appeared at a rate of around one per box. Upper Deck did a great job paying homage to the former elites of the NBA with a classic card design. The huge signing area and simple image combined to showcase a great example of how less can be so much more. A century parallel features a gold image and is hand-numbered to 100. No surprises here. The unquestioned top Wilt Chamberlain card is his rookie offering from 1961-62 Fleer Basketball. Two shades of red and blue text oddly work well in this amazing card. Like 1980-81 Topps and 1986-87 Fleer, 1961-62 Fleer Basketball is an iconic set, and this is the number one card. I own a 1961 fleet wilt chamberlain. I purchased the card at a card store in Williamsburg, VA about 4 years ago. It has not been professionally graded. I had no clue the card was reprinted. Is there any way to tell if it is a reprint. Thanks for your help. Stephen land � If you are legitimately concerned it might be a reprint, then grading it is the safest bet. Given the potential value and what you likely paid, it is very justifiable. That way you can better approximate the value (based on the actual grade) and you can better protect it as it will be slabbed. 1999-00 Wilt Chamberlain Upper Deck Retro Inkredible Auto PSA 10 pop 6!